1 Being iustified by faith, wee haue peace with God, 2 and ioy in our hope, 8 that sith we were reconciled by his blood, when wee were enemies, 10 wee shall much more be saued being reconciled. 12 As sinne and death came by Adam, 17 so much more righteousnesse and life by Iesus Christ. 20 Where sinne abounded, grace did superabound. 1 Therefore being iustified by faith, wee haue peace with God, through our Lord Iesus Christ. 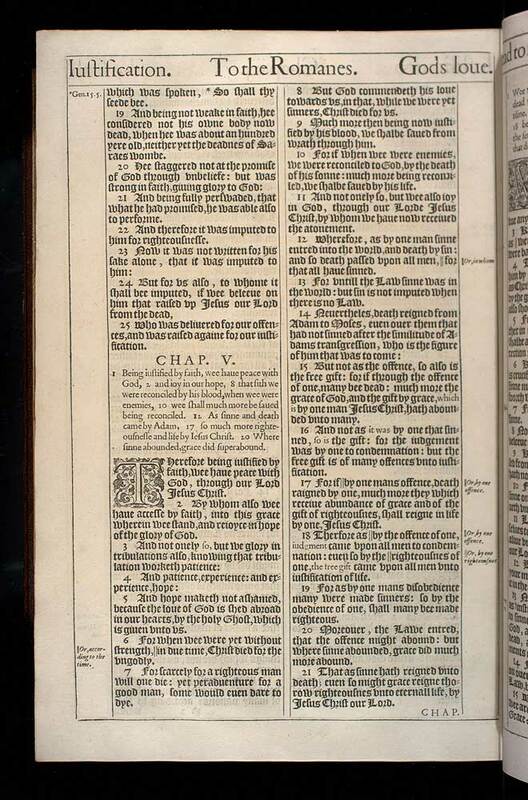 2 By whom also wee haue accesse by faith, into this grace wherein wee stand, and reioyce in hope of the glory of God. 5 And hope maketh not ashamed, because the loue of God is shed abroad in our hearts, by the holy Ghost, which is giuen vnto vs.
7 For scarcely for a righteous man will one die: yet peraduenture for a good man, some would euen dare to dye. 8 But God commendeth his loue towards vs, in that, while we were yet sinners, Christ died for vs.
9 Much more then being now iustified by his blood, we shalbe saued from wrath through him. 10 For if when wee were enemies, we were reconciled to God, by the death of his sonne: much more being reconciled, we shalbe saued by his life. 11 And not onely so, but wee also ioy in God, through our Lorde Iesus Christ, by whom we haue now receiued the atonement. 13 For vntill the Law sinne was in the world: but sin is not imputed when there is no Law. 15 But not as the offence, so also is the free gift: for if through the offence of one, many bee dead: much more the grace of God, and the gift by grace, which is by one man Iesus Christ, hath abounded vnto many. 16 And not as it was by one that sinned, so is the gift: for the iudgement was by one to condemnation: but the free gift is of many offences vnto iustification. 19 For as by one mans disobedience many were made sinners: so by the obedience of one, shall many bee made righteous. 20 Moreouer, the Lawe entred, that the offence might abound: but where sinne abounded, grace did much more abound. 21 That as sinne hath reigned vnto death; euen so might grace reigne thorow righteousnes vnto eternall life, by Iesus Christ our Lord. 6 Or, according to the time. 17 Or, by one offence.